This entry was posted on Friday, February 19th, 2010 at 6:12 pm and is filed under Comics. You can follow any responses to this entry through the RSS 2.0 feed. You can skip to the end and leave a response. Pinging is currently not allowed. 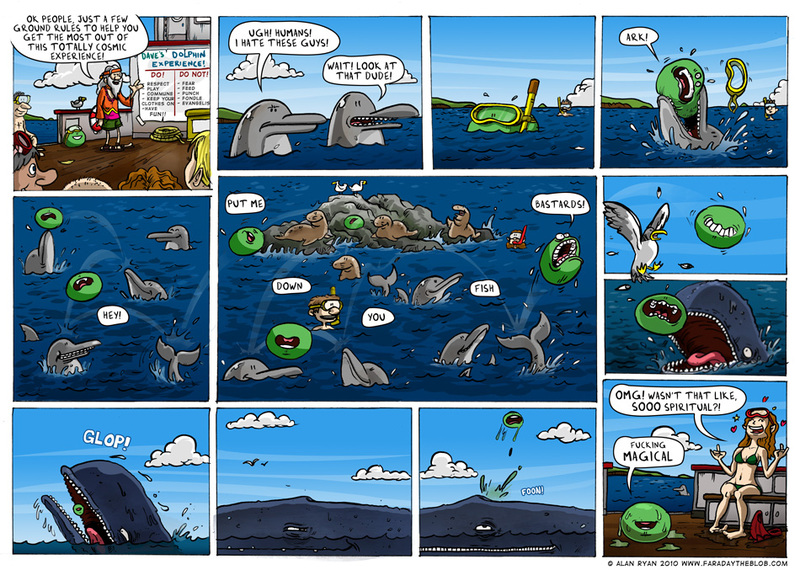 I love the grin on the whale in the second to last panel! And excellent artwork, as always (especially the colouring). testing testing, seem to have lost another comment…? panel 8 (hurtling towards the whale gob) rules..
Central panel does it for me… foon is admired too. Ciaran – Yeah, saw that… Without meaning to make light of a tragedy, I think there might be a clue in the animal’s name ["She was rubbing the killer whale's head..."]! is this just an online comic strip or do you have a novel or a book or something i would love to buy this comic.